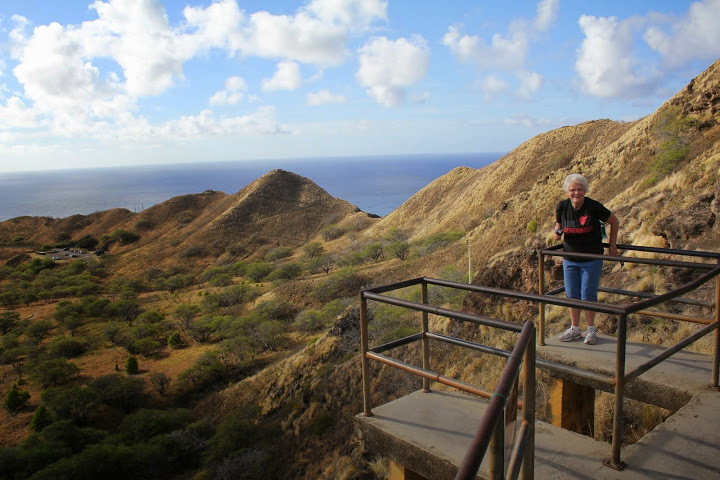 Before leaving on our trip to Oahu, Hawaii I had viewed the Diamond Head climb on You Tube, read the advice from the tour ads, and took the reviews with a grain of salt. 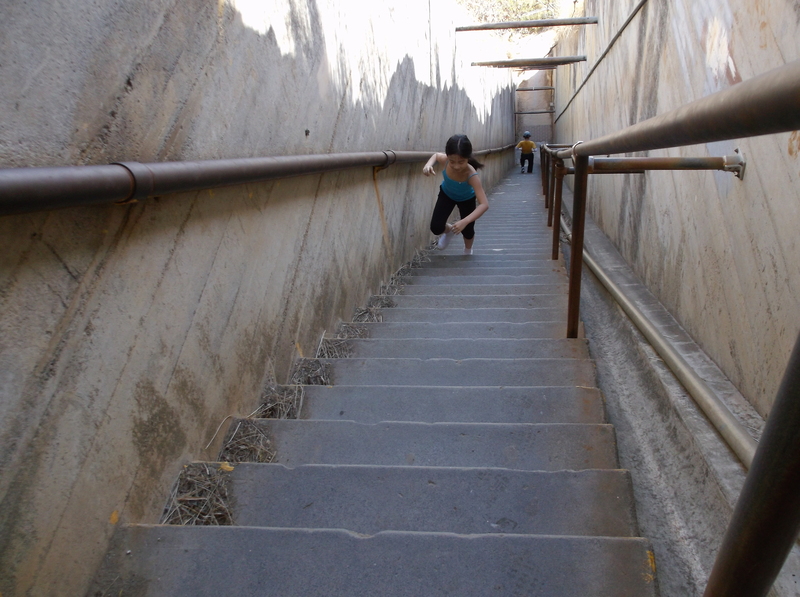 Most of the comments talked about the climb being very doable, while others complained about the heat, the height, the stairs and the tunnels. Frankly I loved them all. We followed the good advice of going early, and on the day in April that we chose to climb, it wasn’t very hot. I had my frozen bottle of water tucked into the back of my jeans which serves very well as a body cooler, and as it thaws, provides a much-needed drink along the way. 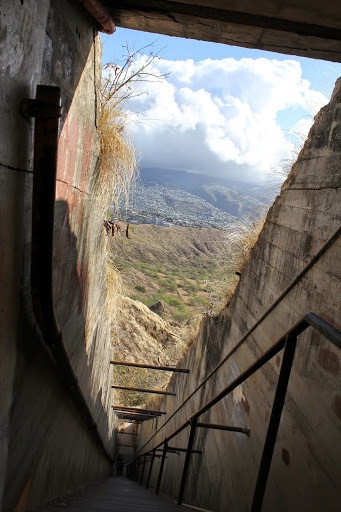 The views from the heights were spectacular, the stairs were a bit of a challenge, (who doesn’t need one on a hike) and the tunnels were cool and flat providing a stair climb recovery. Let’s get started! 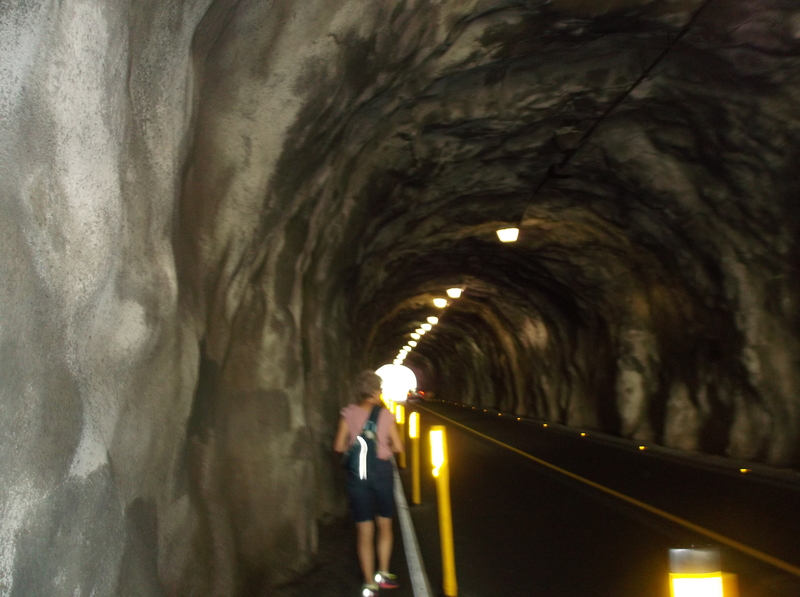 We took the bus to the stop near the entrance and this is the first tunnel we encountered. It’s the one Bruce and I drove through in the book, “A Wish Called Wanda,” when he had to show his military ID to pass. That was 50 years ago, before the summit climb was available. This is basically what we saw then, the inside of the crater. Today we went to the booth, paid our one dollar entrance fee and started going up. I thought I would just mention that the picture of me going up these steps, bears no resemblance to this one. The views start to distract you from the walking and climbing. 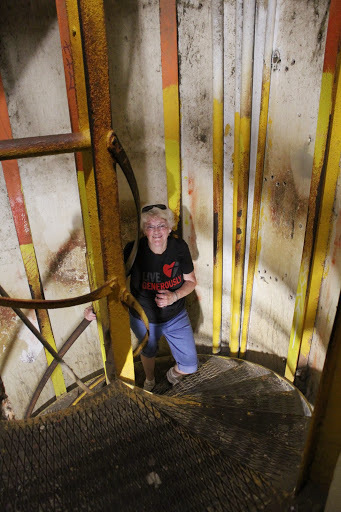 Did I mention the rusty spiral staircase? Just keep climbing, Just keep climbing. By this time you have been in Word War II bunkers, a smaller darker tunnel than the first one and one last climb up a three rung latter out of the bunker and this is your first view down over the summit. 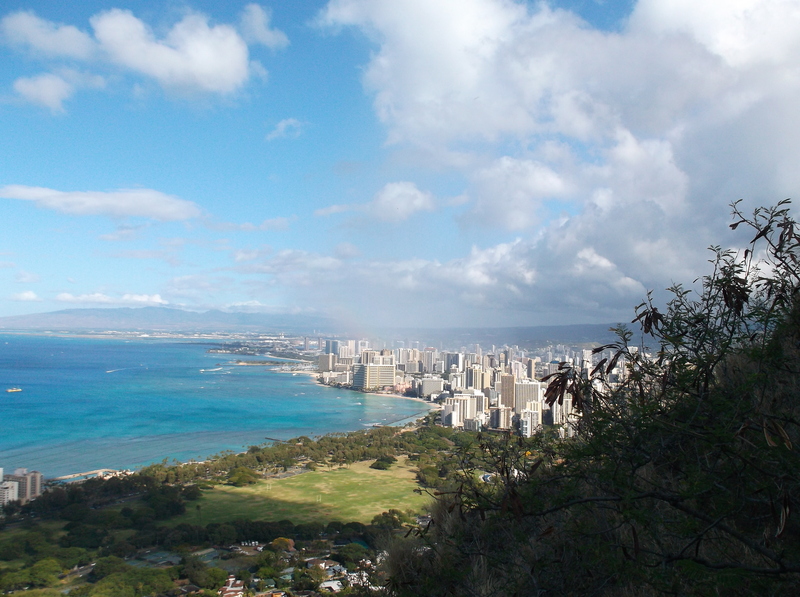 You can go out on a small ledge to capture this view of Kapiolani Park and downtown Waikiki. 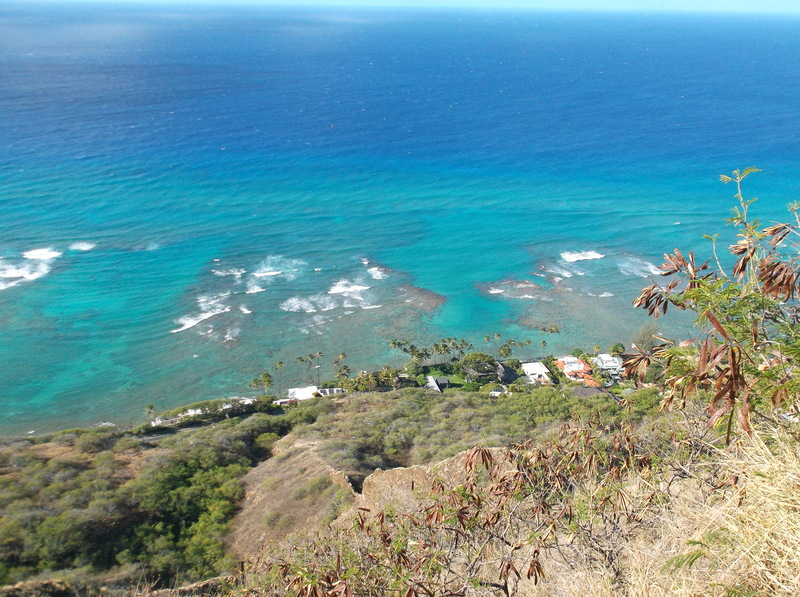 The blue water extraordinaire captures every heart that goes to Hawaii. 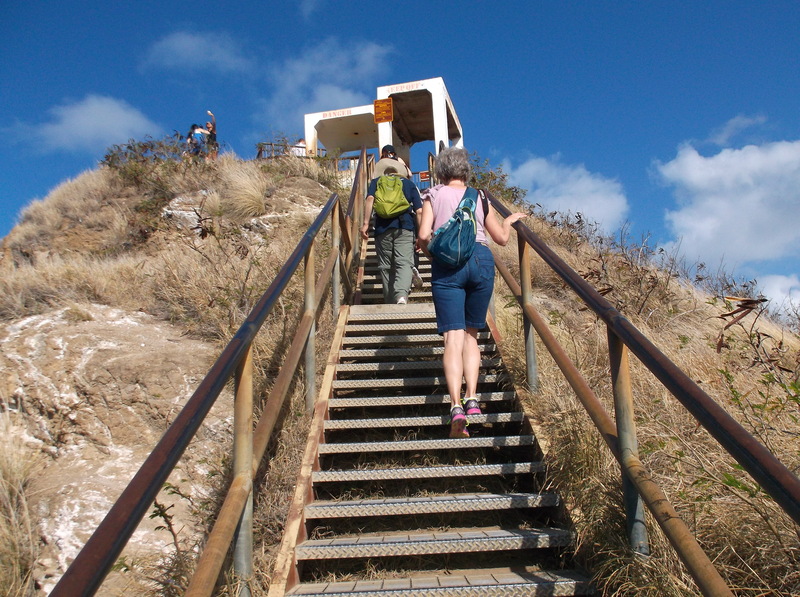 There are more stairs to get to the very top. So up we went, by this time it was, “who cares about a few more steps,” but when I reached the top, I looked down instead of up, got the biggest scare of the day, and headed right back down those steps. No pictures from the very top for me. I looked down and saw several of these little guys running around as I was about to take the next few steps to the very top. 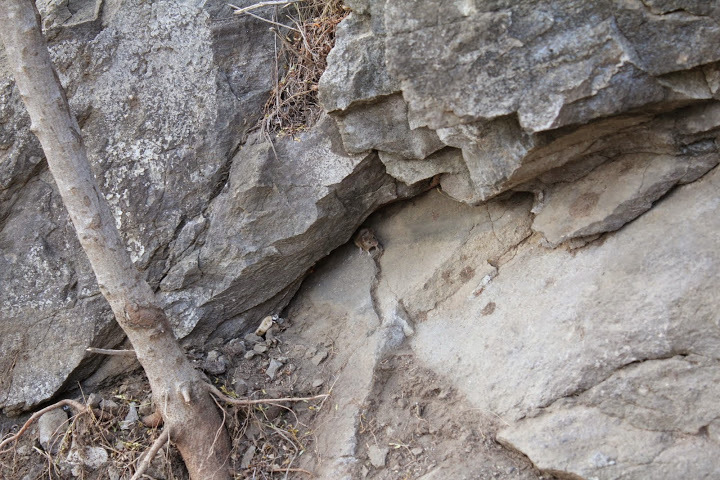 Dee happened to spot one under this ledge on the way down. She was kind enough to get a picture of it for me. For fear of stepping on one of these creatures, I left the premises. My reaction to the first sighting set off a chain of events, starting with a young Japanese man who jumped off the step and fell into another woman. She was quite beside herself when accosted by man running from a mouse. I simply walked down the steps and waited for my companions. 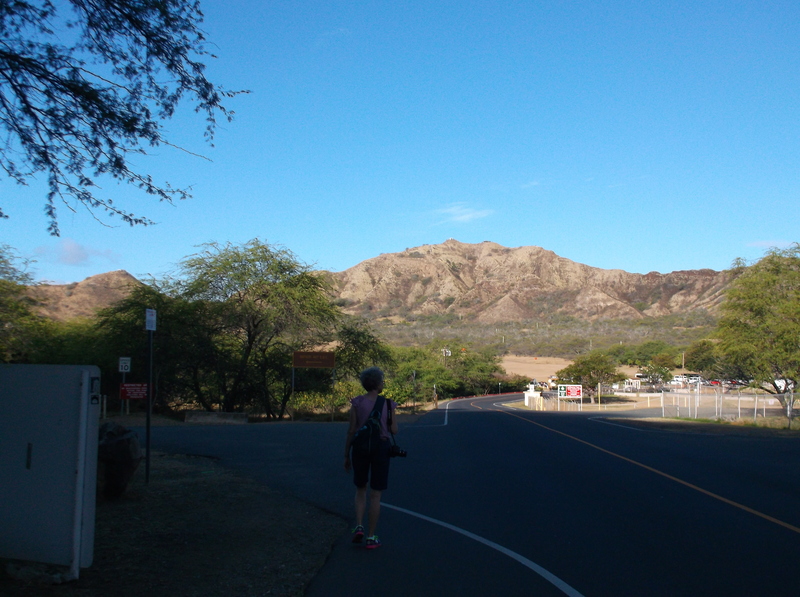 Aloha Oi Diamond Head, thanks for the memories.